MSS has conducted a range of studies on international peace and security issues in collaboration with the International Commission on Peace & Food and the World Academy of Art & Science. MSS continued its collaboration with the World Academy of Art & Science and the Center for Strategic and International Studies to conduct a session in New Delhi on strategies to abolish nuclear weapons in November 2011. A report was prepared on international public opinion regarding the legality, production and use of nuclear weapons, especially data reflecting changes since 1990-95, to trace the change in public opinion regarding nuclear weapons. The report also included a study of the efforts to form nuclear-free zones internationally. MSS staff did detailed research on the advisory opinion of the International Court of Justice concerning the legality of nuclear weapons in 1996 and the process by which the United Nations General Assembly (UNGA) requested the court to examine this issue. A comprehensive report was prepared tracing the movement of the World Court Project and the overall history of the anti-nuclear movement. The Society has plans to organise a session on the ‘Abolition of Nuclear Weapons’ as part of the webinar on Global Rule of Law, which is scheduled to be held in May 2012, and a major conference in collaboration with WAAS and European Leadership Network in September 2012. The World Academy of Art and Science organised an international conference along with the European Leadership Network and Inter-University Center sponsored by the North Atlantic Treaty Organization at Dubrovnik, Croatia on September 14-16, 2012. The conference examined important issues related to nuclear non-proliferation and disarmament, the legality of nuclear weapons and their use, illicit trade in nuclear materials, the dangers of nuclear terrorism, nuclear- and cyber-security. MSS participated in organizing the conference. Garry Jacobs, representing the Society, made presentations on global governance and the evolution of law, on a strategy for resolving the international nuclear crisis with Iran, and on a proposal to conduct an international referendum on the legality of nuclear weapons. Research articles co-authored by MSS on “Sovereignty and Nuclear Weapons” and “Nuclear Threats & Security” were published in Cadmus journal. The end of the Cold War has generated a much more conducive international atmosphere for peace and security. The major powers have made substantial cuts in military spending, resulting in a 30% decline in worldwide defence expenditure since 1988. The international financial institutions and Western nations are exerting increasing pressure on developing countries such as India to significantly cut defence spending as a condition for bilateral and multilateral development assistance. While the movement toward disarmament is very welcome, by itself it does not take into account the legitimate security concerns and real threats to developing countries that necessitate maintenance of military preparedness. Continued progress toward disarmament cannot be achieved without first creating an alternative mechanism to ensure the security against external aggression of nations that agree to reduce their military. Thus far, the United Nations has not proved effective for this purpose except in instances such as the Gulf War where the interests of the Western powers were strongly involved. The Society has evolved a proposal for establishment of an international standing military force, World Army, to offer protection to nations against external aggression. The World Army can be established outside the present UN structure on a voluntary basis, similar to NATO, but strictly for defensive purposes to protect member nations. This proposal was presented to the United Nations and discussed at meetings organized by the International Commission on Peace & Food at UNDP in New York and UNESCO in Paris. Western critics of disarmament site the dangers of rising unemployment as a reason to maintain high levels of military spending at a time when there is no military threat to justify it. As a support for reduced military spending, Society has conducted case studies of more than 20 defence-related manufacturing companies in the USA to demonstrate that there is considerable scope for these businesses to diversify into commercial fields of business without losing the basic skills and manufacturing expertise they have acquired. These studies involved work with ten companies in Kansas and another ten companies in Minnesota, USA. In 2000, MSS launched a new initiative to reduce tensions and build public support for the peace process in India and Pakistan by documenting and publicizing the potential economic benefits to all parties from a peaceful resolution of bilateral issues and close economic cooperation. The Society formulated a proposal for an initiative to document and publicize the potential economic benefits from a normalization of ties between India and Pakistan leading to closer economic cooperation. In May of 2000, MSS had discussions with high level officials in New Delhi and received strong support and encouragement for the initiative. These included two meetings each with L. K. Advani, Home Minister of India, and Brajesh Mishra, National Security Adviser and Principle Secretary to the Prime Minister of India; as well as meetings with Jaswant Singh, External Affairs Minister of India; Farooq Abdullah, Chief Minister of Jammu & Kashmir, along with five members of his cabinet; Sonia Gandhi and other senior officials of the opposition Congress I party in India; Richard Celeste, US Ambassador to India; Ashraf Qazi, Pakistan High Commissioner to India; Abdul Ghani Bhat, President of the All Party Hurriyat Conference of Kashmiri militant organizations; Jasjit Singh, Director, Institute for Defense Studies and Analysis in New Delhi; Director of the Center for Policy Research; and S. Sen, Deputy Director of the Confederation of Indian Industries. In July 2000, two representatives of the Society traveled to Pakistan for meetings with senior government officials including Abdul Sattar, Foreign Minister of Pakistan; Shaukat Aziz, Finance Minister of Pakistan; John Schmidt, Deputy Chief of the US Embassy in Islamabad; Sudeer Vyas, Acting Indian High Commission to Pakistan; as well scholars from the Institute of Strategic Studies and Institute of Regional Studies. In August and September 2000, two representatives of the Society traveled to USA for discussions with senior government officials on the project, including Karl Inderfurth, US Assistant Secretary of State, and other representatives of the US State Department and Commerce Department; Dr. Maleeha Lodhi, Pakistan Ambassador to the USA; Robert Radtke, Vice President, Policy Programs, Asia Society; Michael Clark, CEO, US-India Business Council; and T.P. Sreenivasan, Indian Deputy Chief of Mission. Following these meetings, the Society identified and made contact with three potential collaborators for the project in India and Pakistan: the Confederation of Indian Industry, the Federation of Pakistan Chambers of Commerce, and the Lahore University of Management Studies. In March 2001, the Society met with the three organizations in New Delhi to finalize the scope of the project, a plan of action and budget. All three organizations agreed to participate provided sufficient funding could be arranged. The earlier effort in collaboration with the Confederation of Indian Industry did not materialize after the increasing tensions that followed the Agra Summit in July 2001. In December 2001, the Society conducted a series of discussions with the Federation of Indian Chambers of Commerce and Industry and the Federation of Pakistan Chambers of Commerce and Industry. The Society obtained the consent of both FICCI and FPCCI to initiate the project under the auspices of the Indo-Pakistan Chamber of Commerce. The first meeting was scheduled for December 31, 2001 in New Delhi. Unfortunately, following the terrorist attack on the Indian Parliament on December 13th, air links between the countries were suspended and the project has been placed on indefinite hold. In early August 2005, the Irish Republican Army announced a permanent cease-fire and end to its violent quest for political change in North Ireland. While the world heralded this sudden, dramatic breakthrough, there has been little effort to explain how and why it had happened. In this context, the Society undertook a study to examine the social context in which the breakthrough was achieved and concluded that it was directly linked to the phenomenal economic advancement of the Republic of Ireland, which had been a major supporter of IRA violence. The study confirmed the Society's earlier findings that economic advancement can mitigate or eliminate the impulse toward violence. This finding supports the view that the growing gap between social expectations and existing economic conditions fuels rising violence in society. The findings indicate that rising levels of employment and economic opportunity in Ireland contributed to the gradual reduction in incidents of terrorist violence in North Ireland from 1992 to present. This suggests that a similar strategy based on economic development and employment could be effective in Kashmir and other regions as well. The results of this study were presented at an international conference in New Delhi during November 2004 jointly sponsored by MSS, the International Center for Peace & Development (USA), the World Academy of Art & Science, and other organizations. In November 2005, the Society co-funded and participated in a three day workshop on peace and security issues organized by WAAS and sponsored by NATO. The workshop focused on issues related to nuclear disarmament, elimination of terrorism, establishment of a rapid deployment force, and strategies to promote cooperative security. Society staff made presentations during the workshop on terrorism and nuclear disarmament. In 2004 the Society initiated a new research project on strategies for achieving total global nuclear disarmament. During November 2004 a group of experts chaired by the Society was convened for an international symposium in New Delhi, including retired senior officials from the Indian Navy and Air Force as well as international security experts from USA and Europe. In 2005-06 the Society sponsored and participated in two workshops on peace and security issues. In September 2005, the Society co-sponsored a one-day international workshop on nuclear abolition at Washington DC in collaboration with the World Academy of Art & Science. Participants included former US Defence Secretary and World Bank President, Robert McNamara, former US Ambassador to NATO, Harlan Cleveland, Director of Centre for Strategic and International Studies (New Delhi), Jasjit Singh, as well as senior executives of the World Academy and three representatives of the Society. The meeting focused on abolition of nuclear weapons and establishment of a global cooperative security system. The Society presented papers on establishment of a World Army. The meeting concluded with a proposal to focus on legal efforts to outlaw the use and possession of nuclear weapons on a parallel to what has been done to eliminate chemical and biological weapons through international treaty. In November 2005, the Society participated in a workshop at Zagreb, Croatia co-sponsored by the World Academy of Art & Science and NATO on strategies to enhance international security. The Society made presentations on strategies to abolish nuclear weapons and establish a global security system to promote a culture of peace. On November 24-26, 2005, three members of the Society were invited to participate in the Sixth World Summit of Nobel Peace Laureates organized by the Gorbachev Foundation in Rome, Italy. The meeting was chaired by President Mikhail Gorbachev. More than a dozen Nobel peace laureates and peace laureate organizations participated. The Society held discussions at the meeting with Jonathan Granoff, President of Global Security Institute, USA, on strategies to achieve nuclear disarmament. 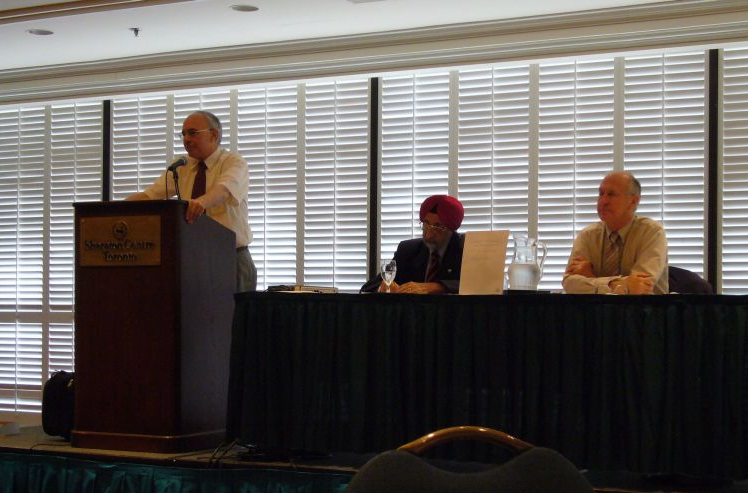 In July 2006, the Society co-sponsored a session on nuclear disarmament at the World Futures Conference in Toronto, Canada and presented a paper on strategies for nuclear disarmament which was published in October 2007. On September 28-29, 2006, the Society was invited to send a special delegation to a high level international meeting of the Middle Powers Initiative in Ottawa, Canada. The conference was hosted by the Foreign Ministry, Government of Canada and inaugurated by Peter Gordon MacKay, Foreign Minister of Canada. It was chaired by the founder of the Middle Powers Initiative, Senator Douglas Roche, Canada. More than 100 participants attended the conference, including diplomats from international organizations and countries around the world plus representatives of leading international NGOs. 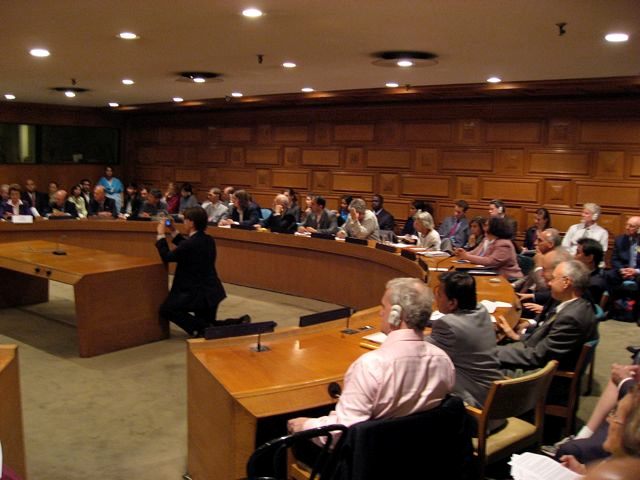 On October 12-13, 2006, the Society co-sponsored a workshop on Nuclear Disarmament in New York together with The World Academy of Art & Science and the Global Security Institute. Participants included three representatives of the Society and leading international experts on nuclear weapons and disarmament issues. Indian Prime Minister, Manmohan Singh, inaugurated an international conference in New Delhi on June 9-10, 2008 to mark the 20th anniversary of Prime Minister Rajiv Gandhi's historic speech to the United Nations calling for complete nuclear disarmament. The conference was organized by WAAS Fellow Jasjit Singh, head of the Centre for Strategic and International Studies, and sponsored by the Ministry of External Affairs of the Government of India. Other keynote speakers included India's President, Pranab Mukherjee; the Vice President of India, Mohamad Hamid Ansari; Minister Mani Shankar Iyer; Canadian Senator Douglas Roche; Australian Ambassador Richard Butler; senior Indian diplomats and military officers; as well as Fellows Jonathan Granoff of Global Security Institute (USA) and Garry Jacobs of the Society. On February 7-8, 2011 the Center for Air Power Strategy, New Delhi and WAAS conducted a two day international symposium in New Delhi on strategies to abolish nuclear weapons. The meeting included delegates from USA, Europe and India. Garry Jacobs presented a paper during the conference representing the Society. Following the conclusion of the WAAS General Assembly in 2005, the Board of Trustees of WAAS decided to constitute a Standing Committee on Peace & Development with specific focus on a program to eradicate nuclear weapons. A member of the Society was appointed Chairman of the Committee and ex-officio Board member of WAAS. The Society prepared and presented a paper at the Annual Conference of the World Future Society in Toronto entitled “Dangerous knowledge: Can nuclear weapons be abolished?” in collaboration with the Centre for Strategic & International Studies (New Delhi). The article was published by Futures journal in Spring 2007. Another paper was prepared and presented by MSS at the international conference in New Delhi on June 9-10, 2008 and published in the book Toward a Nuclear Weapons Free World edited by Manpreet Sethi. Earlier, the Society was also invited to participate in a high level meeting in Vienna on March 29-30, 2007 of the Middle Powers Initiative, a program of the Global Security Institute involving high level diplomats from 25 non-nuclear countries, the UN and other international organizations. MSS also co-sponsored a project with the World Academy to conduct a global essay competition on innovative strategies to achieve total abolition of nuclear weapons in the world. 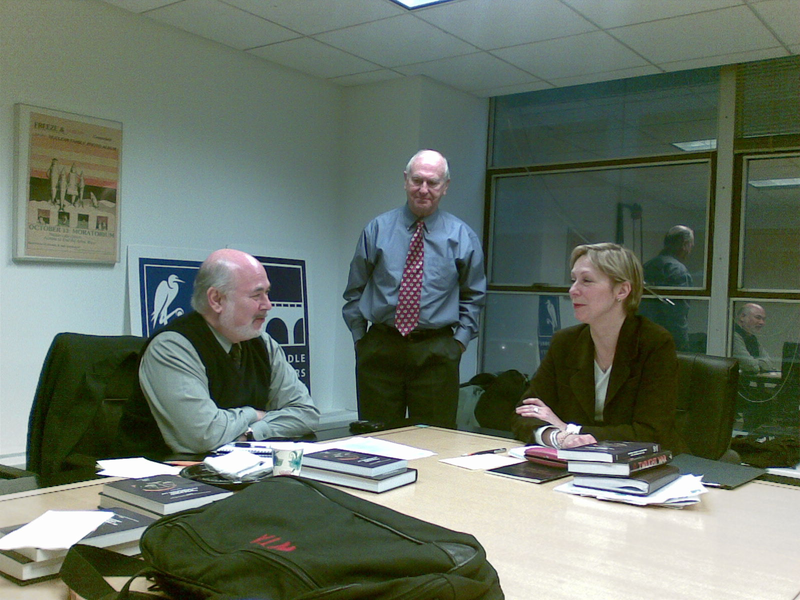 On February 26, 2008, MSS participated in a workshop on the weaponization of Outer Space co-sponsored by the Global Security Institute (USA) and the World Academy of Art & Science in NY. Based on discussions at the meetings in Washington, Zagreb and Rome, the Society launched a new research project to develop a comprehensive theory of peace in 2006. A review of literature reveals that while a great deal has been said about the origin and nature of war, there is no theory to explain the nature of peace in society or the process by which lasting peace is achieved. The Society began identifying the basic principles underlying the growing prevalence of peace in human affairs and formulated some preliminary conclusions. Our thesis is that the evolution of human society results in the emergence of social organizations with an ever increasing capacity to establish and maintain peace over larger geographic areas and more heterogeneous populations. Peace is the result of the evolution of human consciousness from the physical to the mental stage and emergence of social organizations to express that consciousness. In late 2007, the Society began research on the relationship between the formation of the European Union and the end of the Cold War, tracing back the roots of European Integration to the end of World War II.